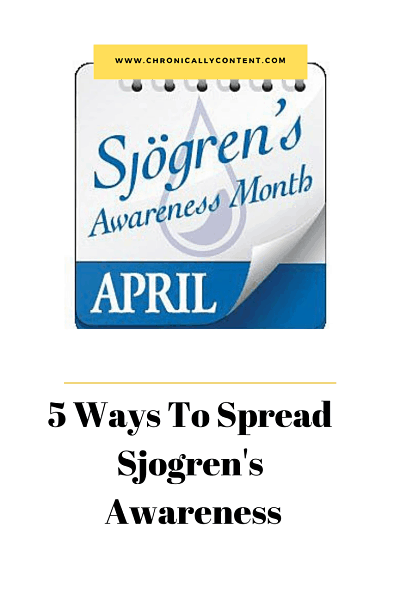 April is Sjogren’s Awareness Month. In collaboration with A Chronic Voice, I’ll be writing my April Prompts as they relate to Sjogren’s. This lesser-known autoimmune condition needs more awareness, because most people don’t understand it. Sjogren’s Syndrome is a systemic disease, which means it affects the entire body. Most people think that it only causes problems with dry mouth and eyes. If that wasn’t bad enough, it can also attack your organs. There are many other awful symptoms, including joint pain and fatigue. A Chronic Voice has given us five new words to get our thoughts going. I hope that I can help you understand Sjogren’s a little more. Maybe you know someone with this disease. If you live with Sjogren’s Syndrome, I’d love to hear how it has attacked your body and how you live with it. Sjogren’s Syndrome makes me tired. It makes me very tired. The Sjogren’s Foundation says that there are 13 types of Sjogren’s fatigue. As I read through the list, I can relate to them all. 1. Basic fatigue comes from the fact that the disease is an autoimmune disease which causes inflammation. Our body is attacking itself. 2. Rebound fatigue occurs because we try to do an activity and then are exhausted. 3. Sudden fatigue happens to us when we were up feeling decent and then a sudden collapse of energy makes us find the nearest place to sit down. 4. Weather related fatigue is caused by changes in barometric pressure (similar to migraines brought on by weather). 5. Molten lead phenomenon is when you wake up and everything hurts and you don’t have the energy to move. 6. Tired wired is fatigue brought on by our many medications. Many of my drugs count fatigue as a side-effect. 7. Flare-related fatigue is just an additional layer of fatigue on top of your normal Sjogren’s fatigue. 8. Fatigue from other diseases happens when we have another illness that causes fatigue, which most of us do. 9. Fatigue that impairs concentration puts us in a brain-fog with fatigue. 10. Stress and distress brings on an emotional fatigue. 11. Fatigue from lack of sleep. Most of us deal with insomnia from pain, medications, or discomfort. 12. Normal aging fatigue happens to those of us who are getting older and get the fatigue that everyone else gets. 13. Chronic fatigue syndrome is when you feel like you have the flu every day, though many doctors and friends think that you’re just depressed. Tired yet? After reading about fatigue, I know that I have dealt with all 13 types. No wonder that I’m tired. I’m an educator. I come from a long line of educators. With two degrees in education and years of teaching music and homeschooling all my children, I can honestly say that I love to help people learn. I hope that I can help to educate you on the complexities of Sjogren’s Syndrome. The theme of the Sjogren’s Foundation awareness month this year is The Complexities of Sjogren’s. Each day this month, they are sharing one persons life story and how each one is different. Most of us with Sjogren’s know how complex this disease is and how difficult it is to get diagnosed. Sjogren’s Syndrome facts: Systemic Autoimmune Disease – Dryness is extensive – profound fatigue – chronic pain – major organ involvement – neuropathies and lymphomas – 9 out of 10 with Sjogren’s are women – treated by rheumatologist – no cure – symptoms treated. If you suspect Sjogren’s in yourself or someone you know, you’ll need to ask your doctor. They will conduct tests: bloodwork and a possible lip biopsy. The bloodwork is where the doctor will look for autoimmune disease numbers, especially SSA and SSB markers. Diagnosis can be hard, because the symptoms could also mean another autoimmune disease. But, the lip biopsy shows a specific factor that proves Sjogren’s Syndrome. This is how I was diagnosed. Receiving brings to mind getting an award. When I get an award, the first thing I do is to accept it. Getting Sjogren’s Syndrome isn’t exactly an award, but as I received the diagnosis I had to accept it. This step was the most important. If you want to do things to help yourself deal with all the challenges of having a systemic disease, you must first accept the challenge. After I accepted Sjogren’s, then I was able to start any and all treatments recommended by my rheumatologist. Starting Plaquenil (usually the first drug to try), wasn’t pleasant. I knew that I would have to adjust to the side-effects. Plaquenil is given to us because it’s given to Lupus patients. They don’t know exactly how it works, but it appears to prevent worsening of the disease. The sleepiness and nausea took months to fade, but I knew that I had to do it. The other treatments don’t help much, but I must always stay open-minded about things that could help me feel better or prevent organ-involvement. I think about what Sjogren’s is giving to me. Well, the above symptoms are one thing that I’ve been given. But, I’ve also gained a new perspective on life. Instead of the outlook that says, “I can’t wait for the future, so that I can enjoy my life”, I now try to enjoy each day as it comes. When people talk about using the china, etc, I can relate. I don’t want to put off anything for the future. I also want to be giving something to you. I want to give my sweet readers information that could possibly help them or a loved one learn about and deal with chronic illness. Chronic illness can’t really be understood unless you have one. But, it’s important for everyone to try and understand the life that we live. Giving you the knowledge that we aren’t lazy or fakers, and that we really want to participate as we once did. I hope that I also can give you a little encouragement. Chronic illness, such as Sjogren’s Syndrome, isn’t the end of life. As long as we are alive, we have value, we can do something, and we can have joy. We may need to pace ourselves like crazy, but there is something we can do each day. Maybe we can only read a book or write a post. Perhaps you can read a book to a child or paint a picture. Praying is something I do everyday. I’m giving thanks to God every day for every little thing. Speaking of prayer….. Praying is a time of quiet. I usually pray silently. The small or large prayers of thanksgiving are just one type of prayer. I thank God when a headache lifts, but I also thank Him for being my savior. Many mornings, I beg Him to help me with my pain and energy to get out of the bed. I trust Him, during these quiet moments, to do me good. Even though I suffer pain, the peace and joy in my quiet heart is sustaining me. Does it sustain you? Thanks for joining us again Lisa, and for wisely using the prompts to raise awareness on Sjögren’s Syndrome. I too, live with it, and sometimes (oftentimes!) it can cause more pain than Lupus for me. It’s really an underestimated autoimmune disorder. Thanks so much for sharing Lisa! I’d heard sjogren’s mentioned before, but didn’t really know what it is – your post gave me a much better understanding! I did something similar this month, as I have Functional Neurological Disorder, and this week is FND awareness week! It’s an unusual chronic illness, and much more common than most people(including neurologists who are responsible for its diagnosis) realize! You Sjogren’s journey does sound exhausting and like quite a struggle – I just want to give you some solidarity as a fellow person with a chronic illness(with a partner with an autoimmune disorder)! Thanks! It doesn’t get much attention, but we’re working to improve that. Thanks for the support and I wish you all the best in your journey. Hi Lisa, and what a great post using the prompts to raise awareness of one of your conditions. It’s not something that I have dealt with before, so it was really interesting to find more about it.